There is now an at-a-glance statistic on the Full Transaction Report graph for "Net Received on Flipcause". 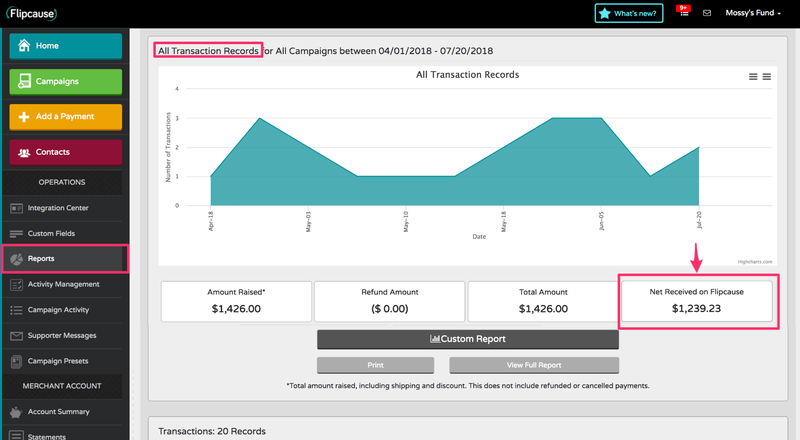 Once you filter the report by campaign and click "Generate Report", this number will tell you how much you received on Flipcause from the transactions, minus any processing fees your organization paid to Flipcause. 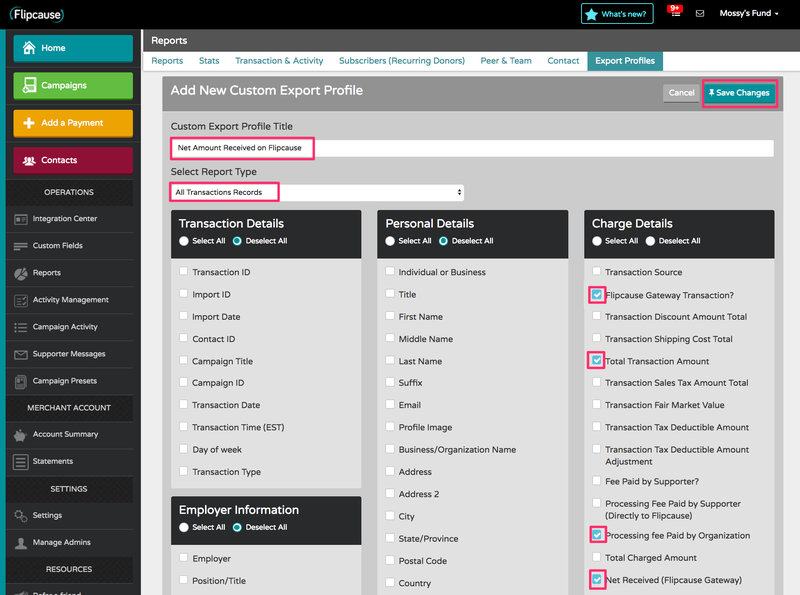 Go to the "Reports" tab and click "Transaction and Activity Reporting"
Select filters for desired Campaign and Date Range, and select Report Type: "All Transaction Records"
"Net Received (Flipcause Gateway)" (Amount per transaction that your organization receives, or "Total Transaction Amount" minus "Processing Fees Paid by Organization"
Export the report via email. Once you receive the report via email, remove all records with "No" in the "Flipcause Gateway Transaction?" column (to exclude manually recorded offline payments from the report). Sum up each column in your preferred spreadsheet program (Excel, Google Sheets, etc). This will give you the sum total of all fees paid by your organization and the net amount received through the Flipcause platform for this transaction. 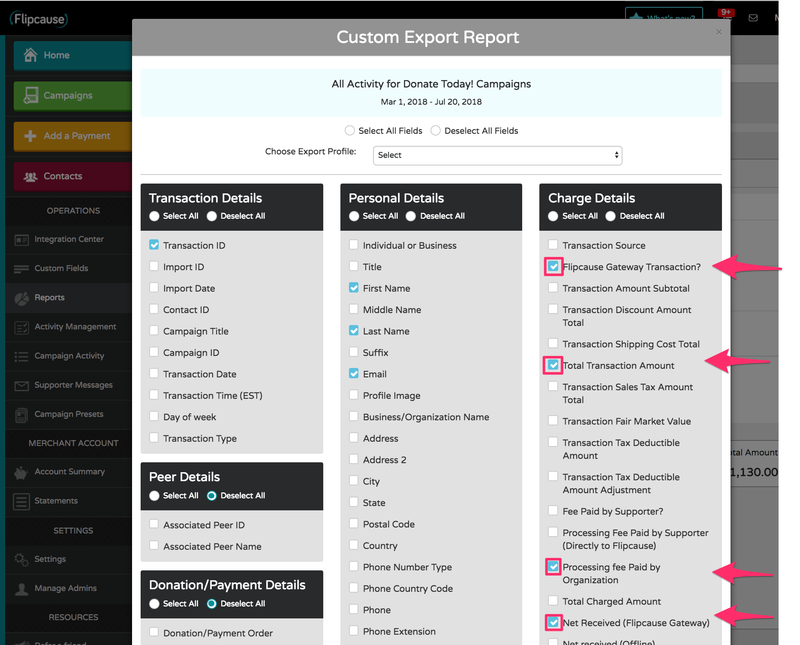 Click "Add New Custom Export Profile"
Title the Profile "Net Amount Received on Flipcause", and choose Report Type "All Transactions Records"
Next time you generate a report for any of your campaigns and click "Custom Report", select this profile from the drop-down menu. As always, you can contact your Success Team or use your Concierge Form to request specific reports. We'd be more than happy to deliver you the exact report you need! The team at Flipcause is actively working on an exciting new release for Saved Reports and Advanced Filtering, which will make this process much easier. Thank you for working with us as we bring these new features to you!